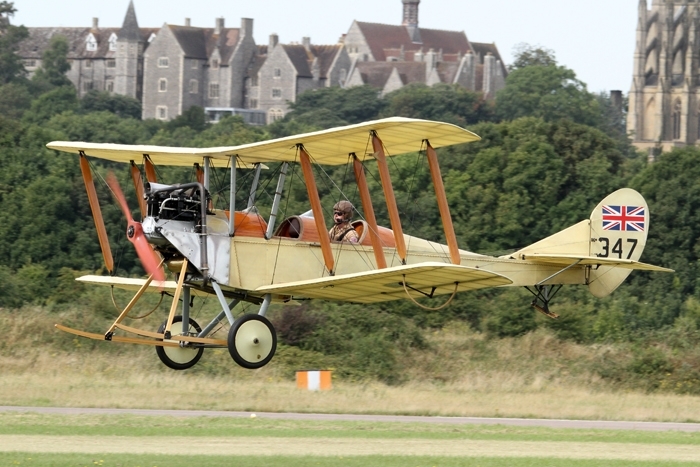 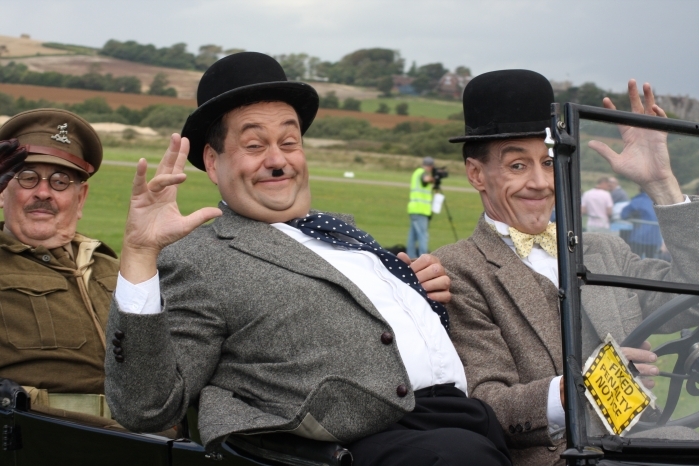 Shoreham Aerodrome was officially opened on the 20th June 1911 and was used by the Royal Flying Corps (RFC) during the First World War, and again by the Royal Air Force (RAF) during the Second World War. 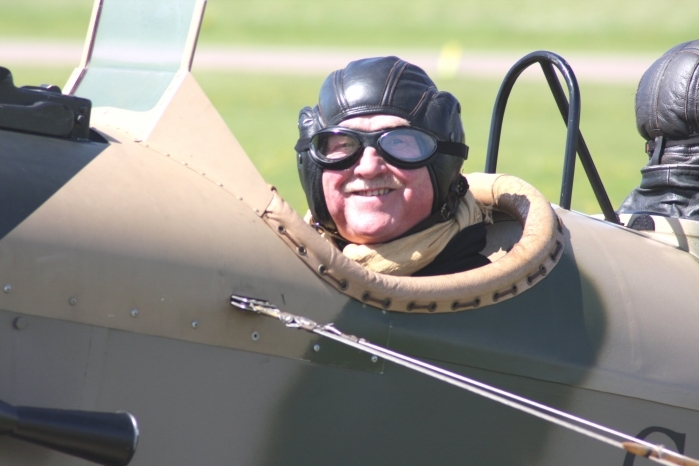 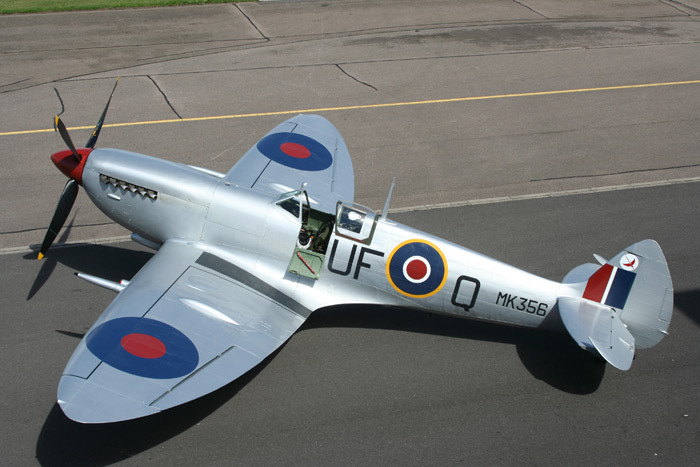 Operating a variety of aircraft including Lysanders, Spitfires, Hurricanes and Beaufighters. 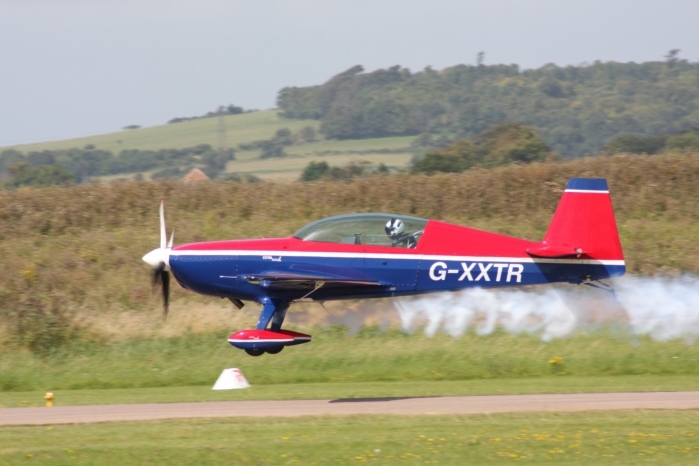 At the present time the airport is used by flying schools and units maintaining light aircraft and helicopters. 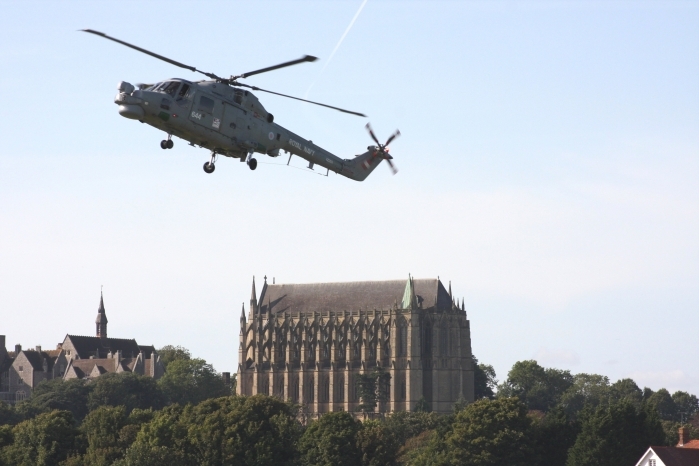 For the last few years in the late summer Shoreham has hosted a two day air show raising funds for the Royal Air Forces Association (RAFA). 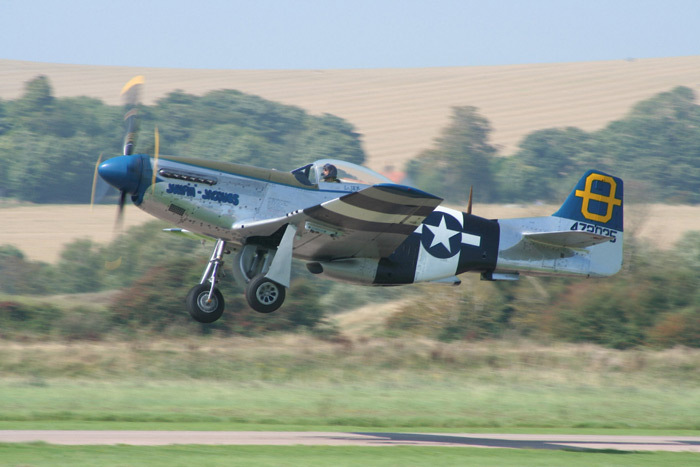 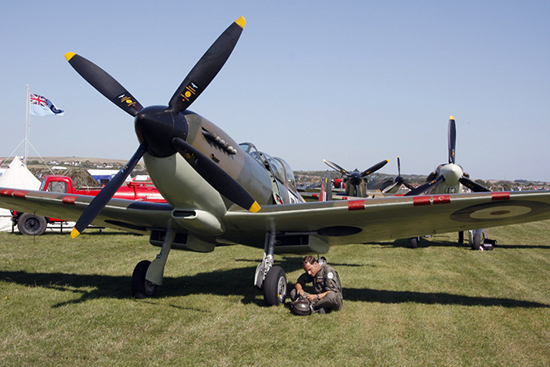 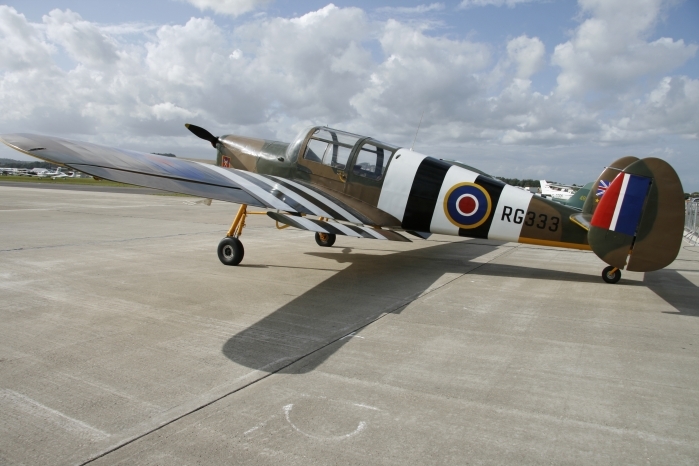 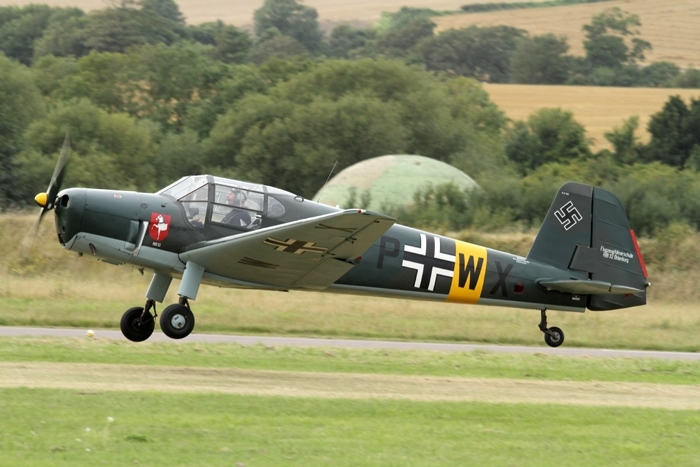 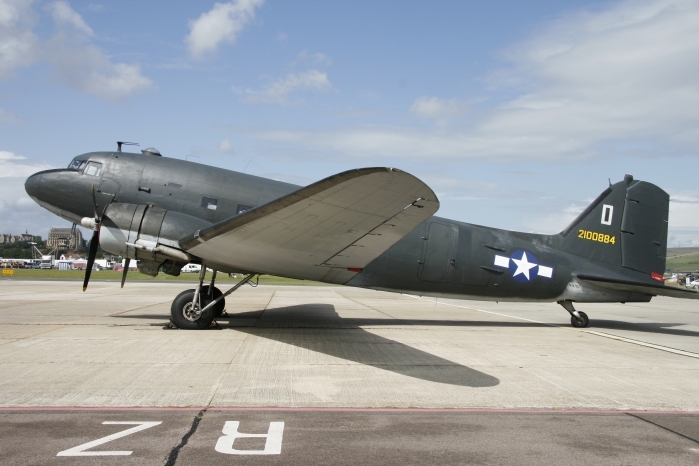 2013 was the 24th air show held at Shoreham Airport in West Sussex. 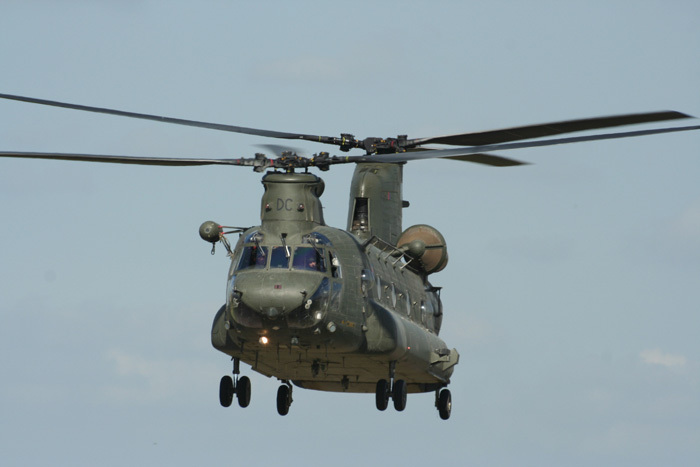 Presented and put together by the local branch of (RAFA) Royal Air Force Association. 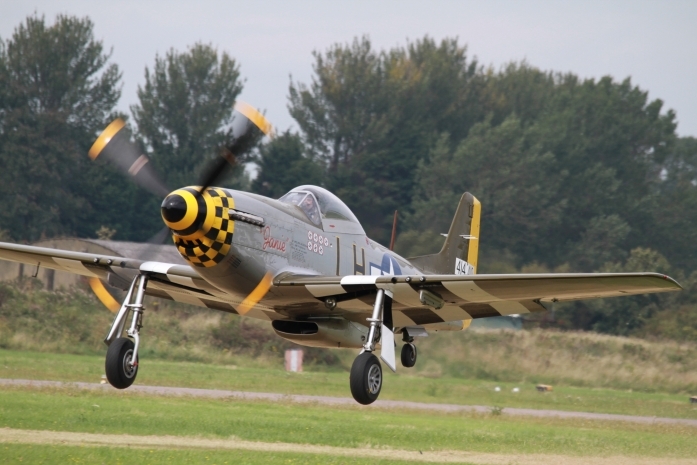 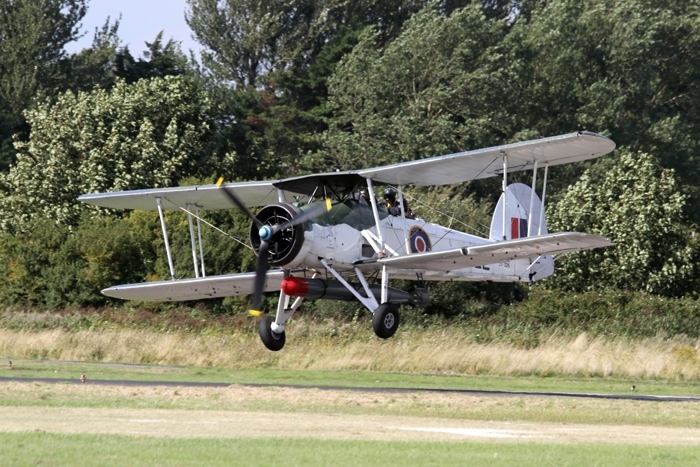 Sun and fun for the weekend with plenty of attractions on the ground and great display flying for all the family. 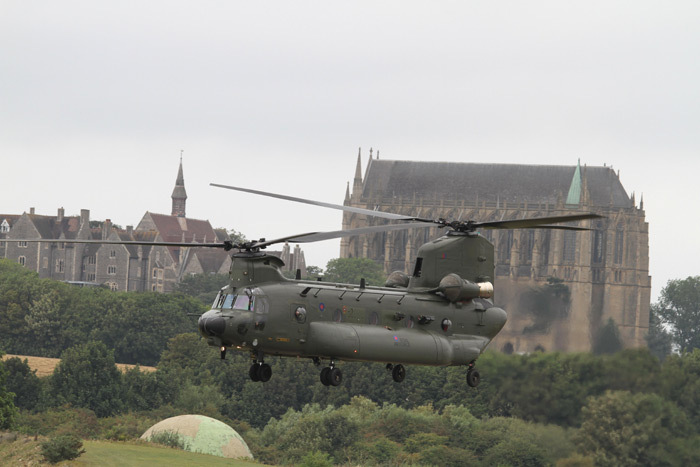 To open the show was the RAF Falcons Parachute Display Team, once on the ground the salute was taken by WG CDR Arthurton from No. 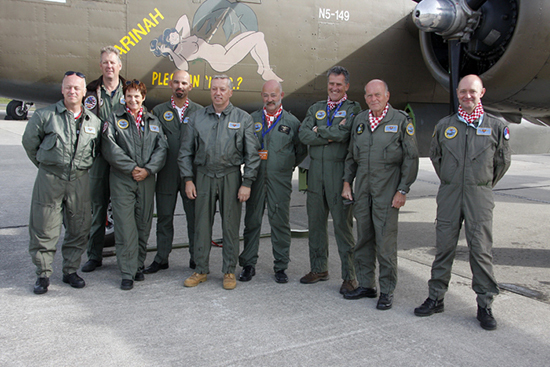 617 Sqn, who was patron for this year's air show. 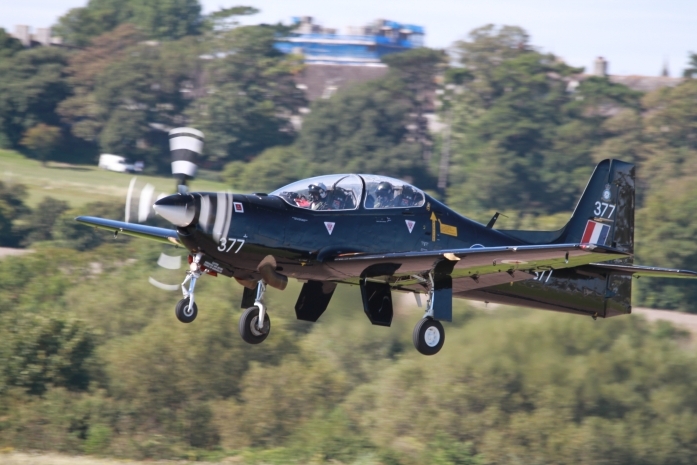 On with the flying, The Trig Aerobatic Display Team with Richard Grace and Dave Puleston, BAC Strikemaster MK.82A, the Bucker trio with a Jungmann, Jungmeister and a Bestmann, flew a tight and steady formation. 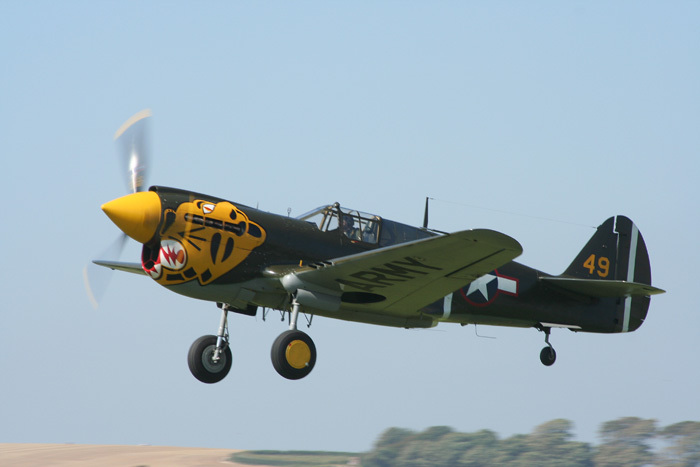 From the Naval Historic Flight were the Fairey Swordfish and the Hawker Sea Fury, with the Great War Display Team of WWI, Pete Tiechman's Hangar 11 Collection based at North Weald, flew the Curtiss P-40M Kittyhawk with its new markings of Lulu Belle with the skulls head. 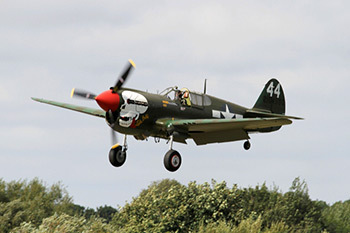 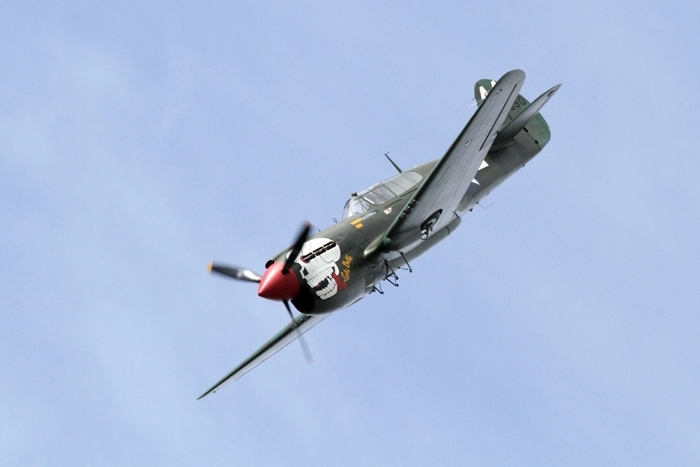 Now with the Skyraider from Kennet Aviation, it flew a beefy display despite its size. 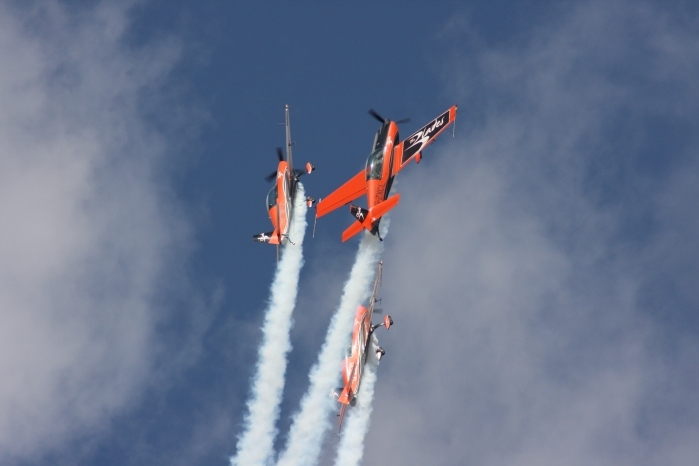 From large to the small, are the RV8tors, fast and tight formation flying, great display. 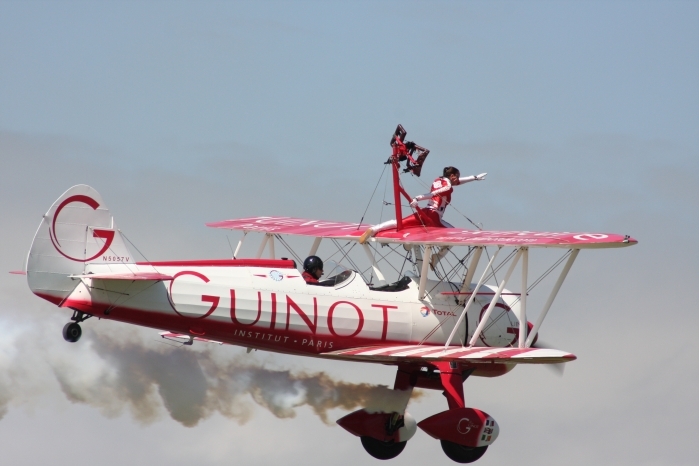 Other aircraft that supported the show, the Tiger 9, gliderFX, Wingwalkers from Breitling, Justyn Gorman with his Extra 300L, The Turbulent Team flew their Druine D.31. 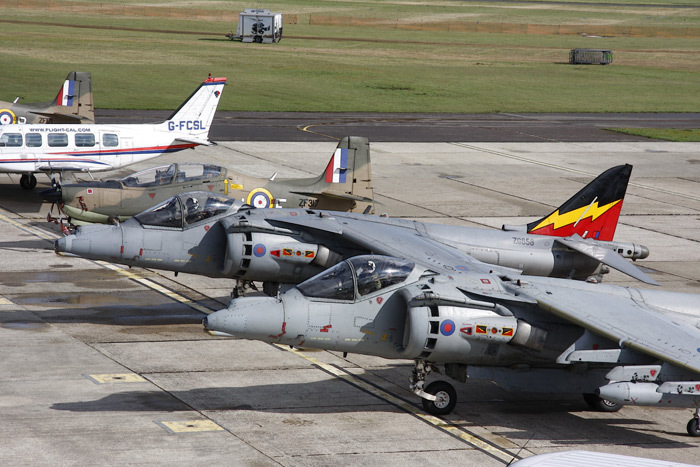 From the RAF, BBMF, Short Tucano T1 and the Typhoon FGR4. 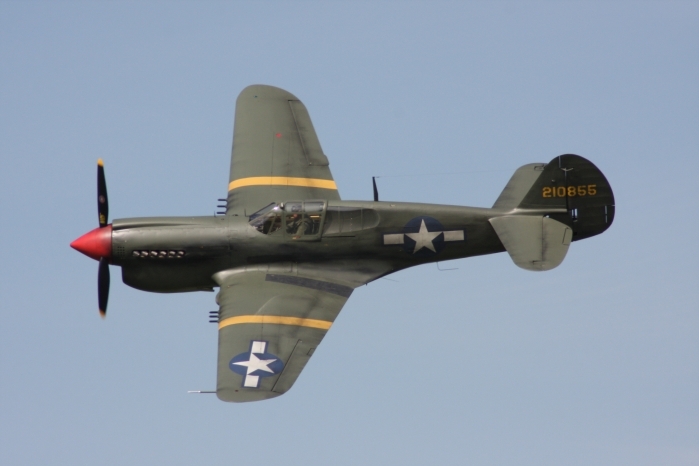 Now for the 8th Air Force Commemoration, consisting of B-17 Sally B, B-25 Mitchell, Dakota C-47, P-51 Mustang, a pair of Piper Cubs and the F-86A Sabre. 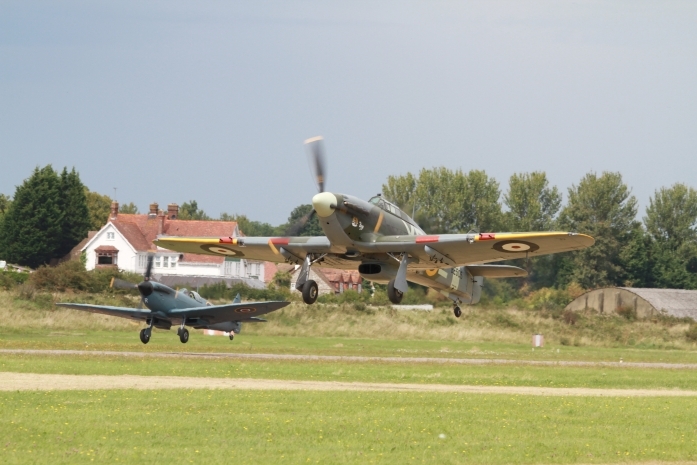 As always, the outstanding Battle of Britain scramble including, Spitfires, Hurricanes, and two Buchons as the bandits. 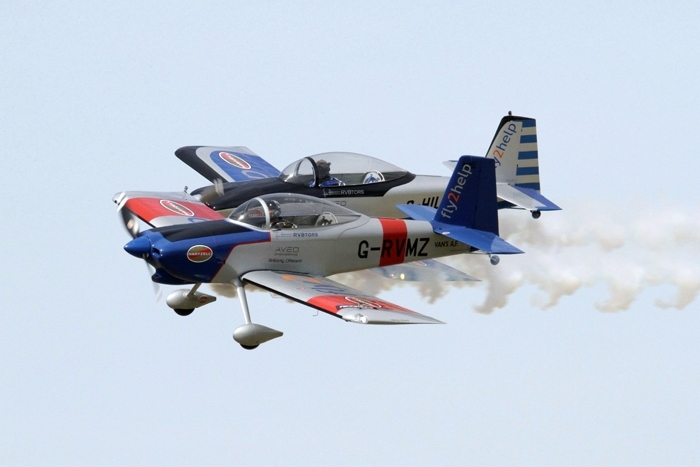 Shoreham Air Show has become one of the best in the UK, with 1.8 million raised for (RAFA). 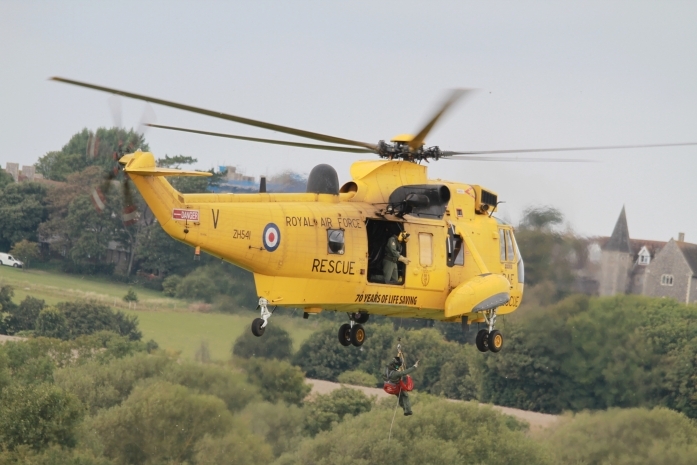 Well done to one and all. 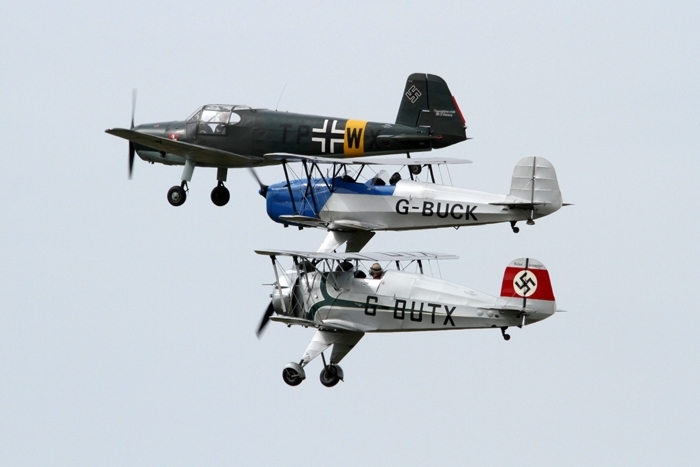 This year the weather was kind and brought out the best in flying displays. 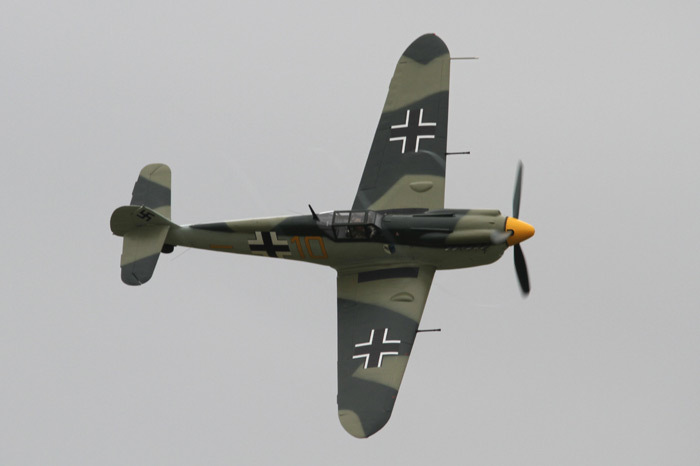 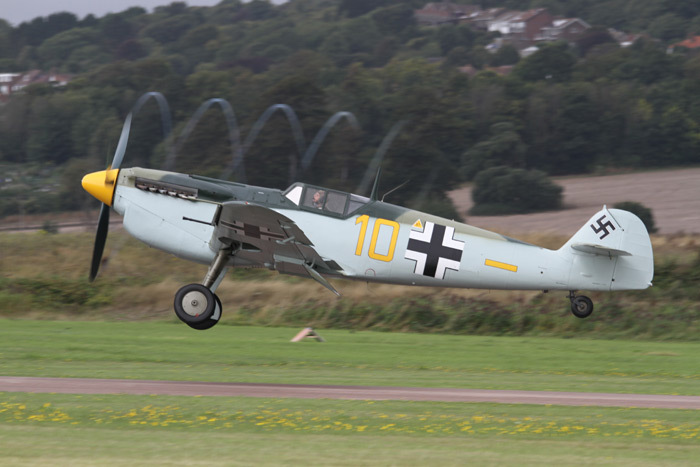 John Romain and Clive Denney flying the Buchon and the Me 108, being chased by a Spitfire and a Hurricane brought back memories for the older generation. 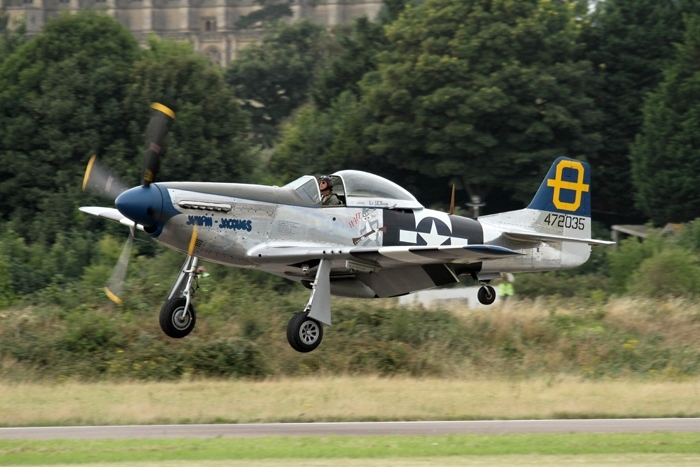 The fast moving display and tight formation flying by Maurice Hammond and Dave Evans in the pair of Mustangs from Hardwick Warbirds (which are based in Suffolk) was a pleasure to watch. 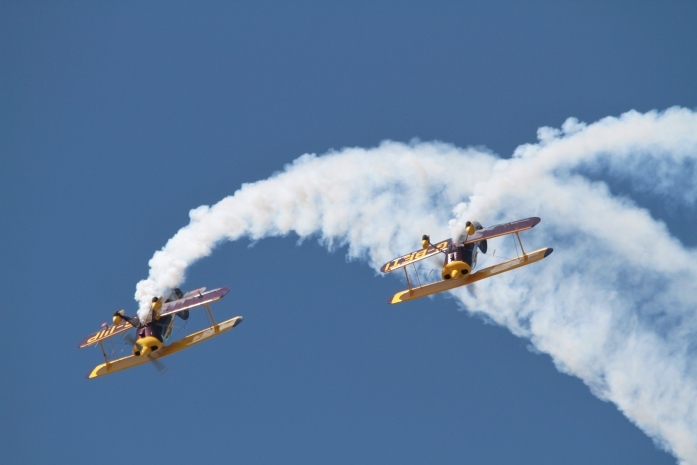 Also with their own brand of display flying were The Blades who are undoubtedly one of the best display teams flying smaller aircraft, and if you want to go smaller and what appears faster, what better pairing than the Pitts Specials. 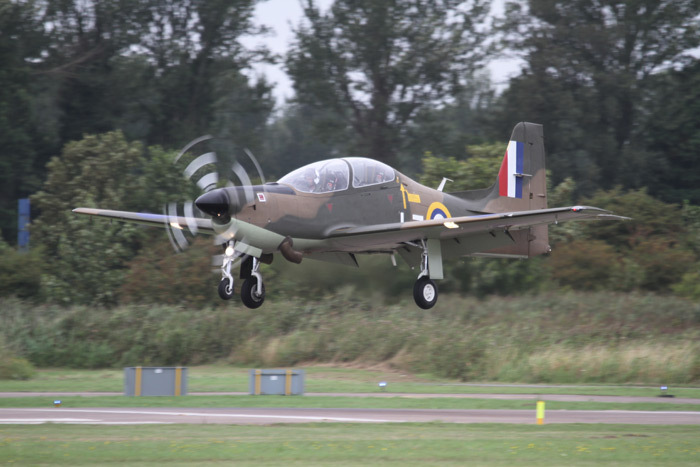 The RAF were represented by displays from the Tutor and Tucano. 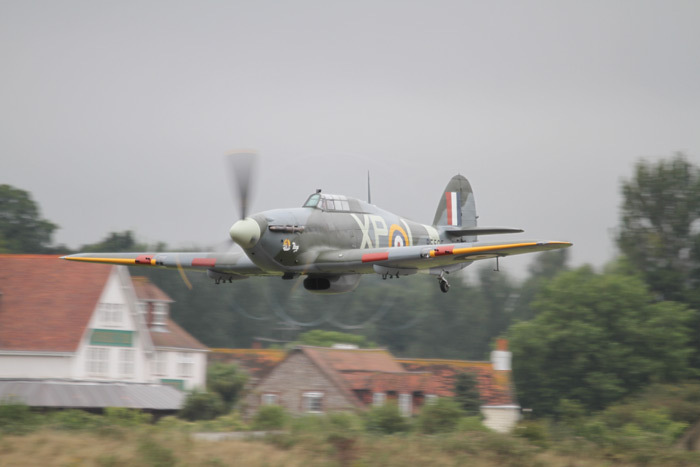 From North Weald there were displays by The Gnat Pair, and Peter Teichman’s Spitfire and Hurricane. 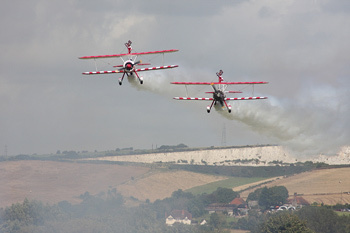 Another four-ship formation team with precision flying was the Yakovlevs. 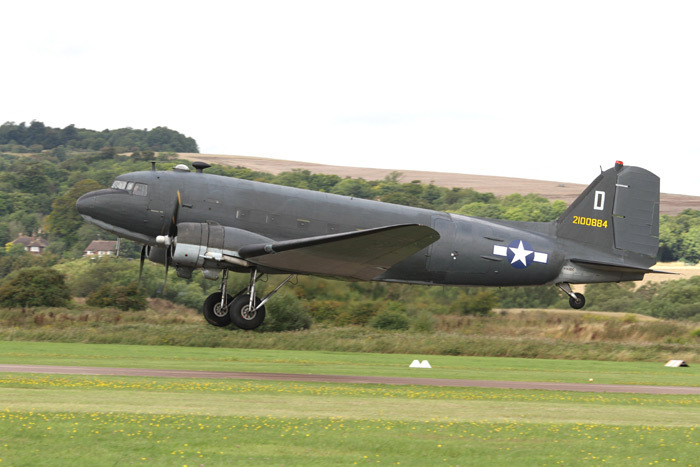 Slowing things down were the majestic Sally B and Catalina from Duxford. 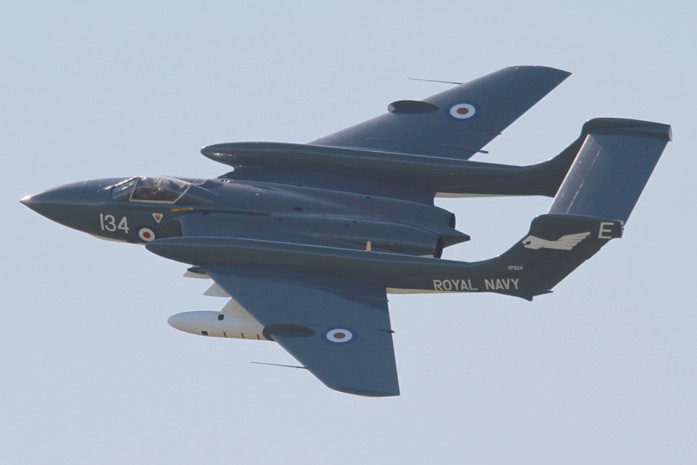 The Vulcan was replaced by the Sea Vixen and what a replacement. 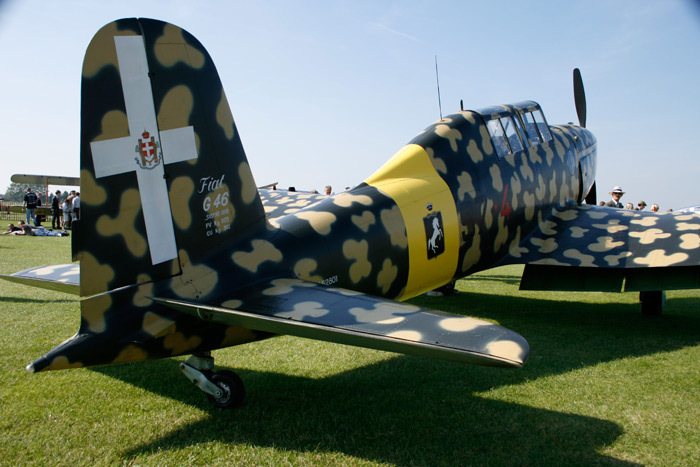 Display of the day, awesome! 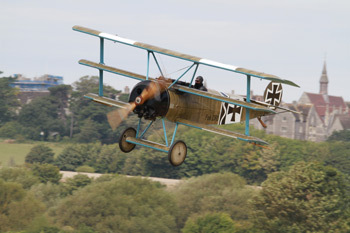 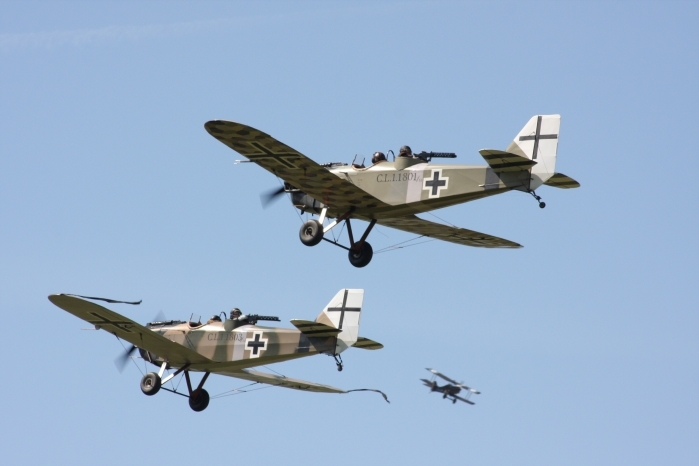 Also at Shoreham were The Great War Display Team with their display of slow moving but precision flying. 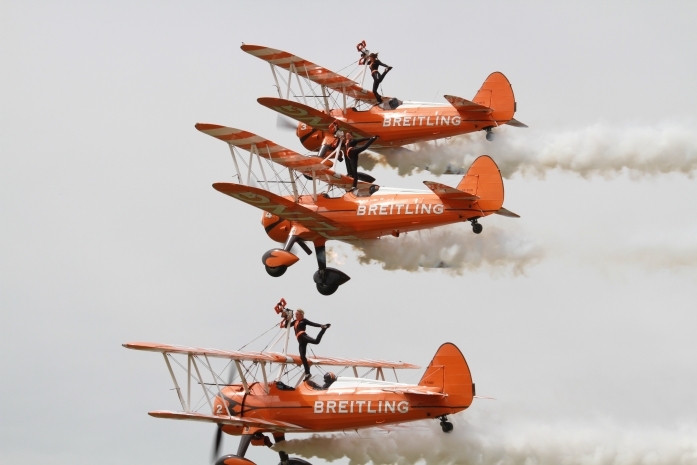 To add to the family fun, Brendan O’Brien’s Flying Circus demonstrated his specialty of truck top landings. 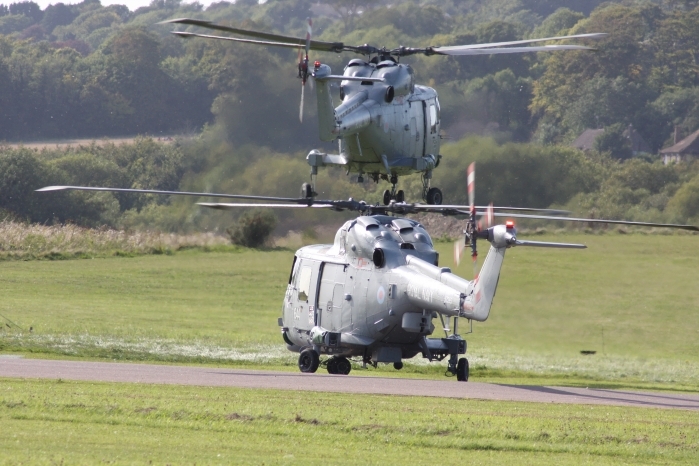 A good weekend for RAFA and for the close on 80,000 people who attended the event. 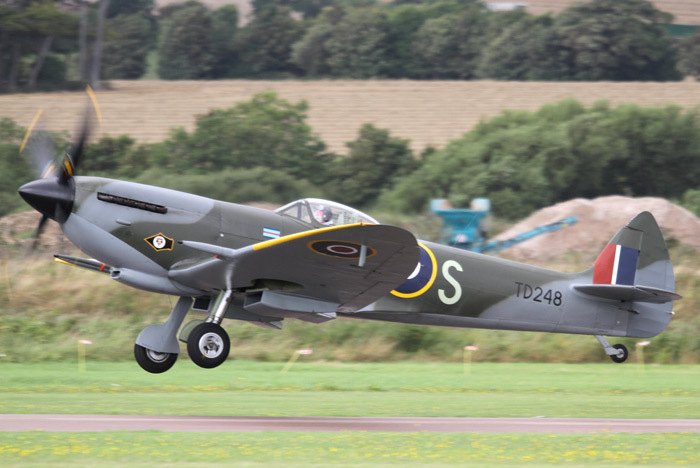 The annual Shoreham Air Show is an eagerly awaited event situated along the south coast, but this year with rain showers and low cloud threatening the arrival and displays of the aircraft, things were not looking good. 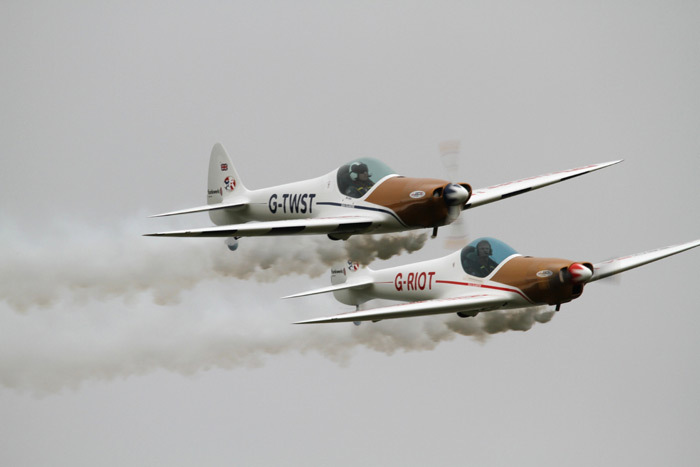 As it happens some aircraft did make it, including the Mustang pair flown by Rob Davies and Maurice Hammond, also The Twister Duo managed a full flying display despite the low cloud base. 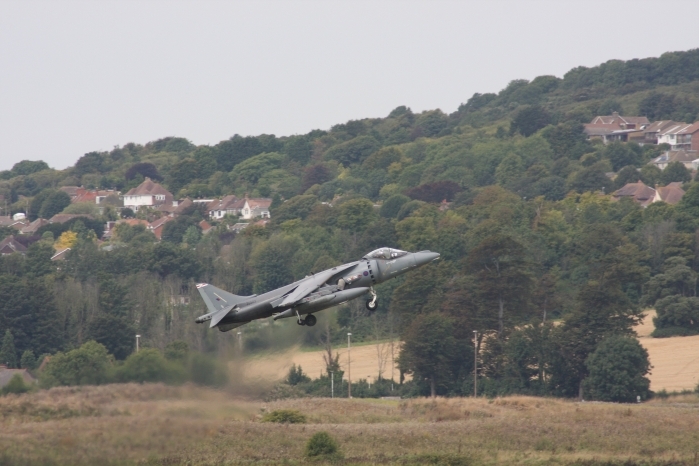 A superb display by the Harrier thrilled the crowds. 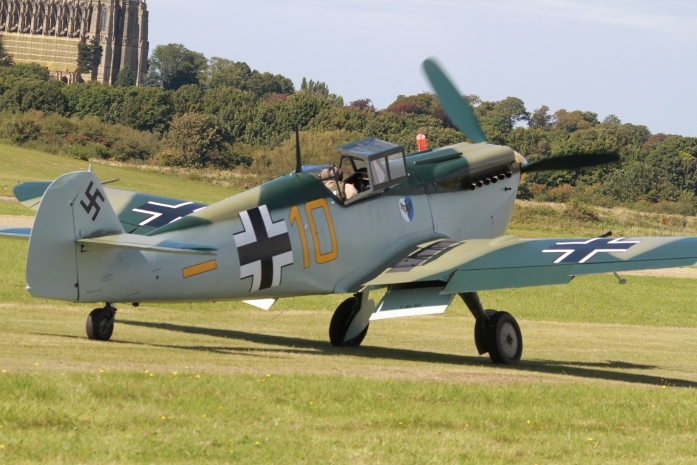 Probably the highlight of the weekend was The Battle of Britain 70th anniversary dogfight by the Hispano Buchon against the Spitfire. 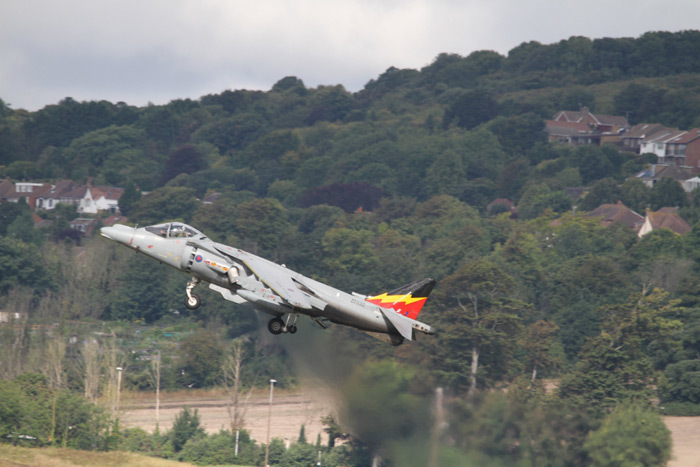 Months of hard work goes into the planning of an air show and a weekend of bad weather can soon ruin it, so a big thank you to all those concerned who put in so much hard work. 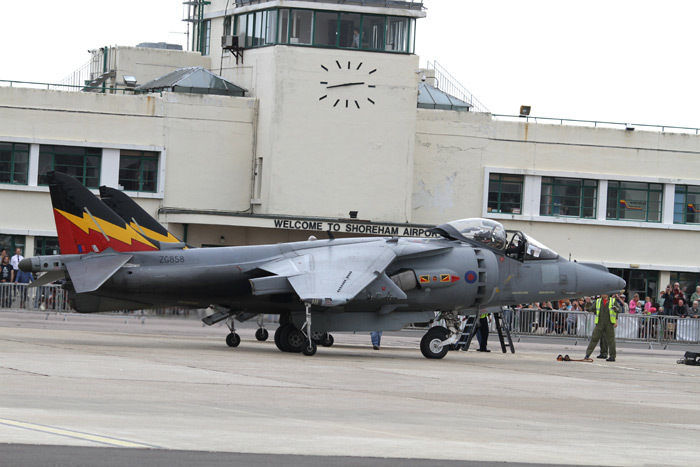 August 22nd/23rd 2009 was the 20th anniversary air show to be staged at Shoreham Airport. 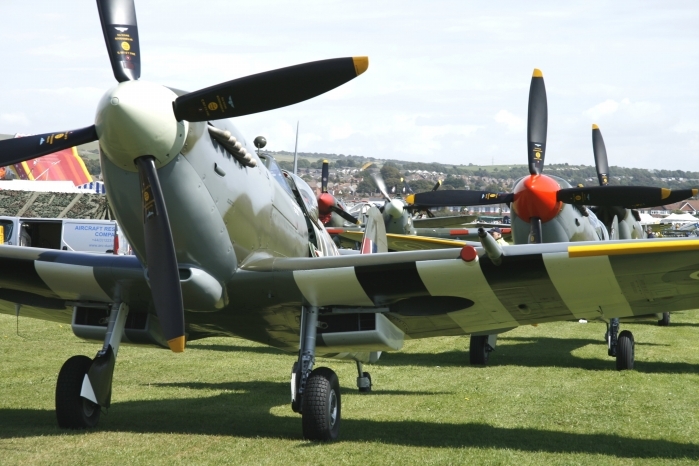 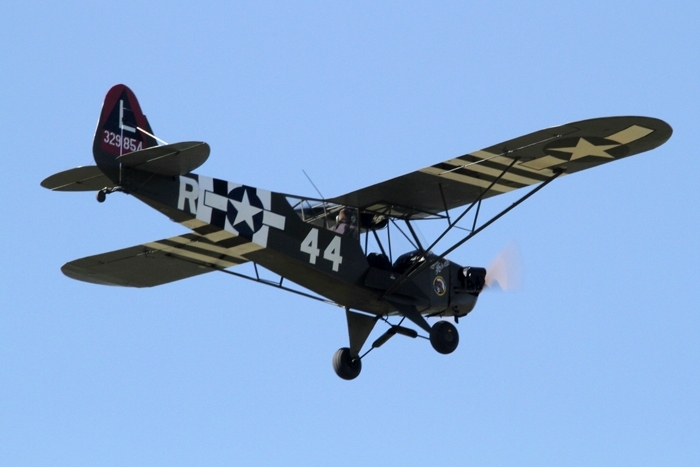 Raising funds for Charities which include the Royal Air Force Association (RAFA), Shoreham has become one of the best air shows in southern England. With the magic of fine aircraft it makes such an air show worth coming back to year after year. 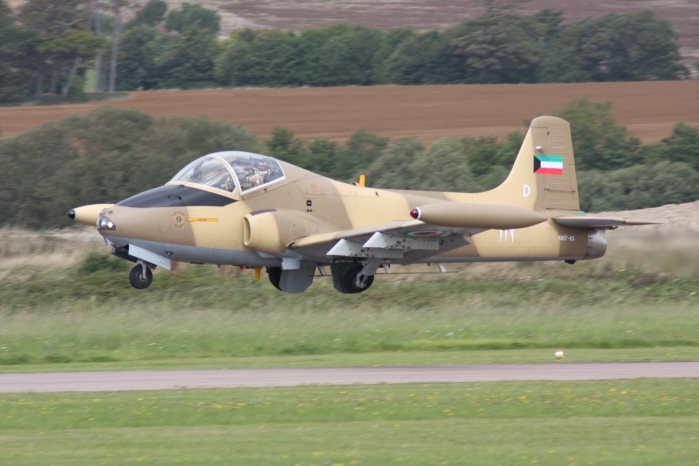 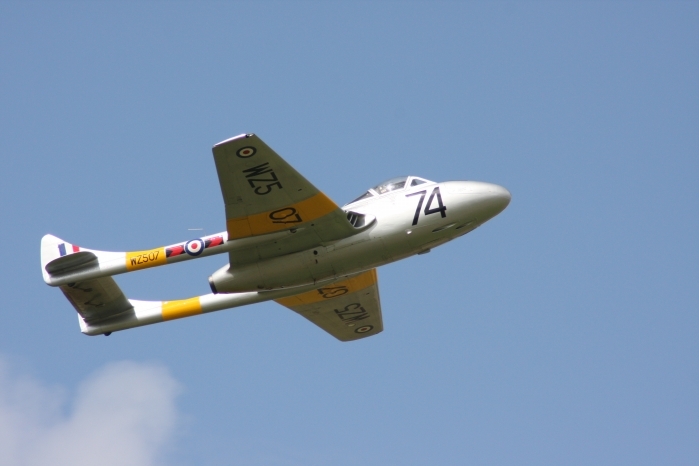 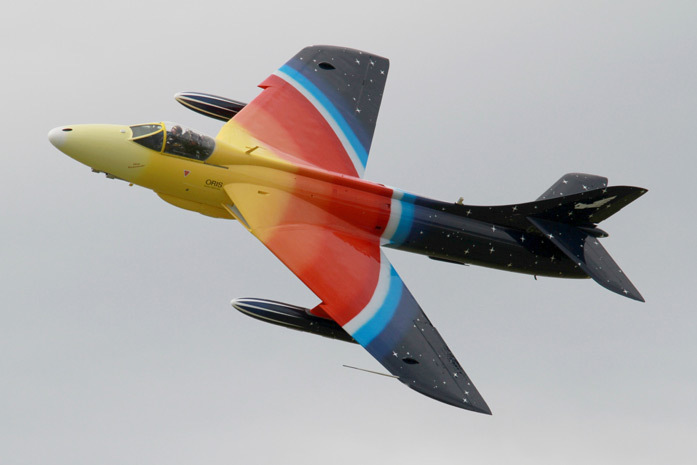 Starting the 2009 display, a welcome return by the Strikemaster flown by Tom Moloney. 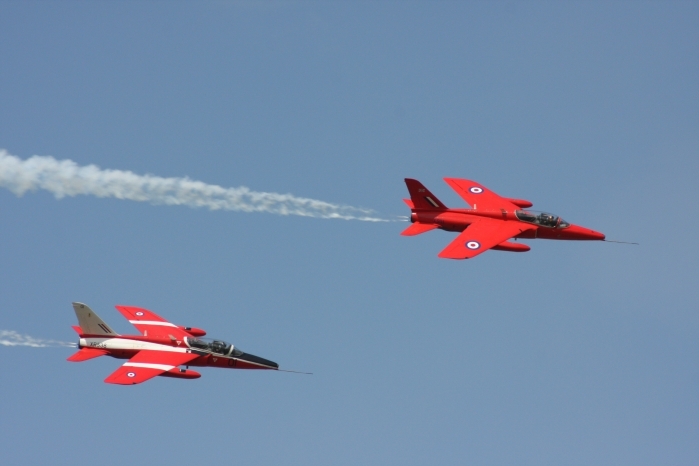 Also displaying were a pair of former RAF Folland Gnat T1 aircraft. 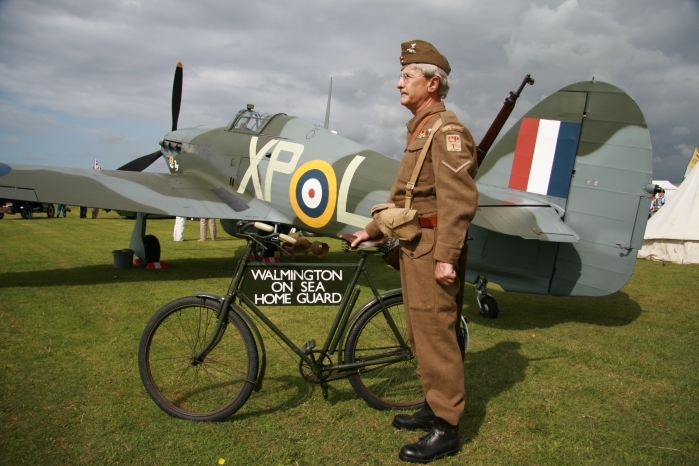 With the sights and sounds of the wartime years, The Battle of Britain Flight put in an appearance. 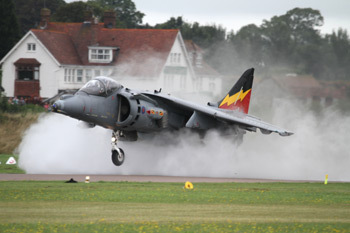 Always a favourite at air shows, nostalgia that we must never forget. 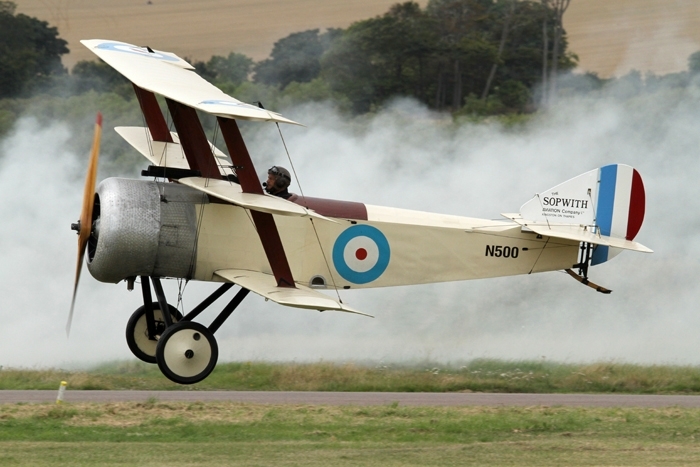 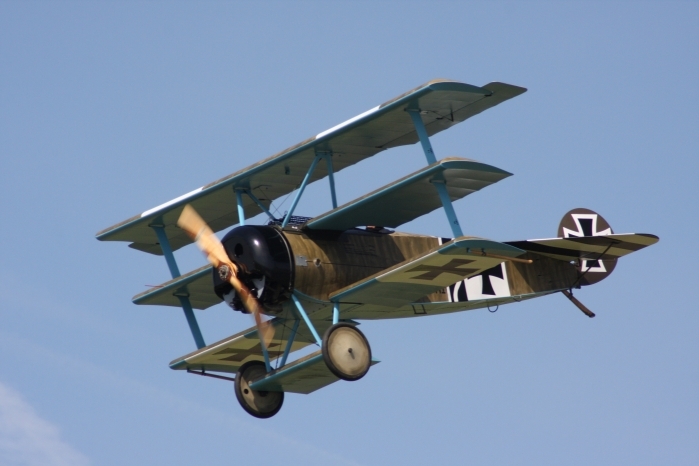 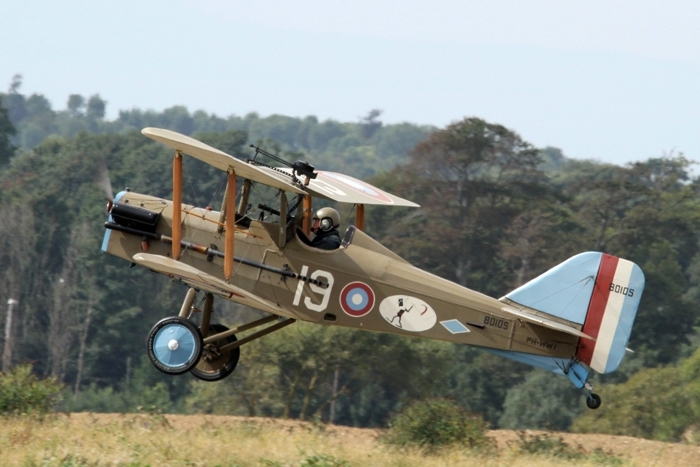 The Great War Display Team recreate some amazing dogfights with their replica aircraft from the First World War. 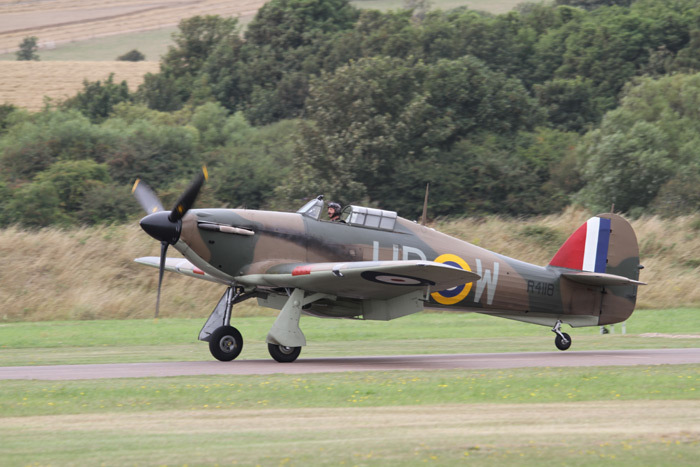 A very welcomed first appearance at Shoreham was Peter Teichman's Hawker Hurricane (Hurribomber) with over four years of restoration work. 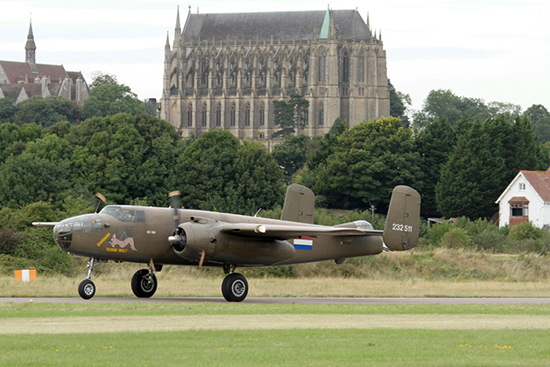 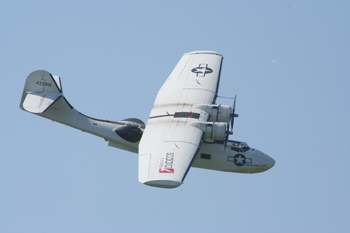 Another World War II survivor, with a smooth display and great to see the aircraft out on the air show circuit. 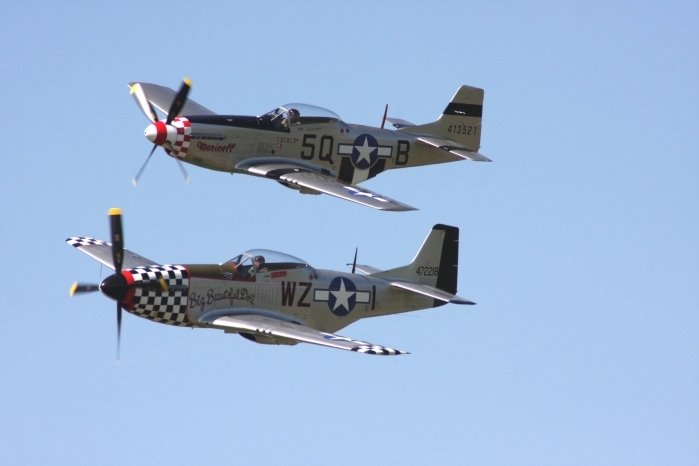 Some more nostalgic sounds were from the two P-51 Mustangs flown by Rob Davies and Maurice Hammond, tight formations at their best. 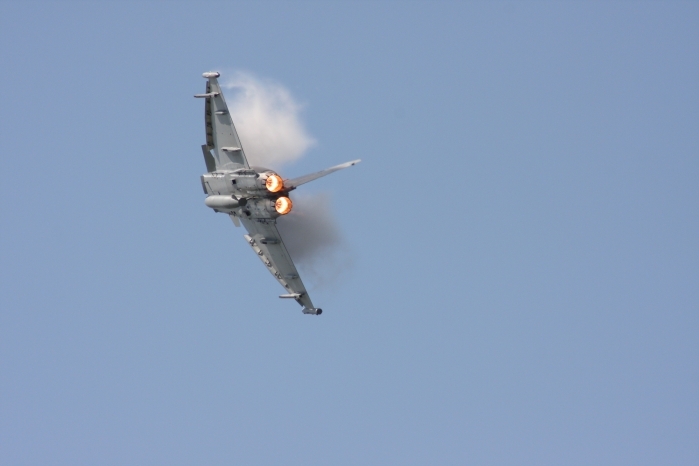 Other displays were from the RAF, the Typhoon, Hawk, King Air and the Tutor. 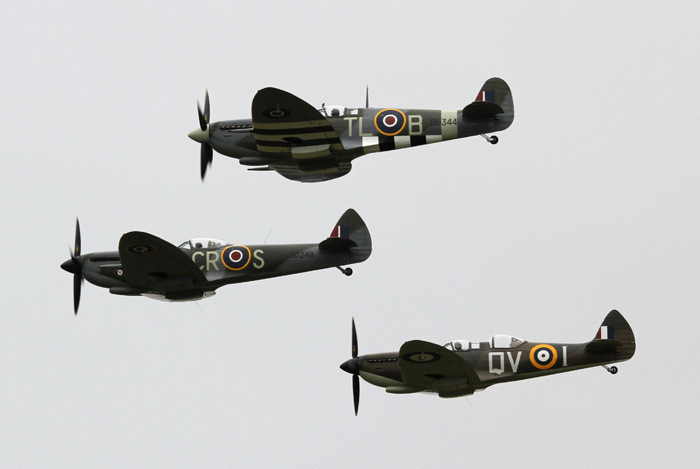 There was also a Spitfire and Hurricane scramble, The Royal Navy's Black Cat Helicopter Display Team, a Vampire and The Matadors. 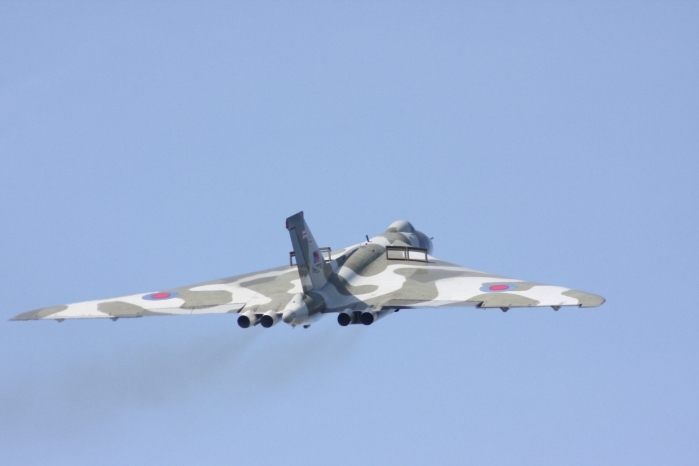 With superb flying weather and two days of great displays, one aircraft everybody wanted to see was the Avro Vulcan. 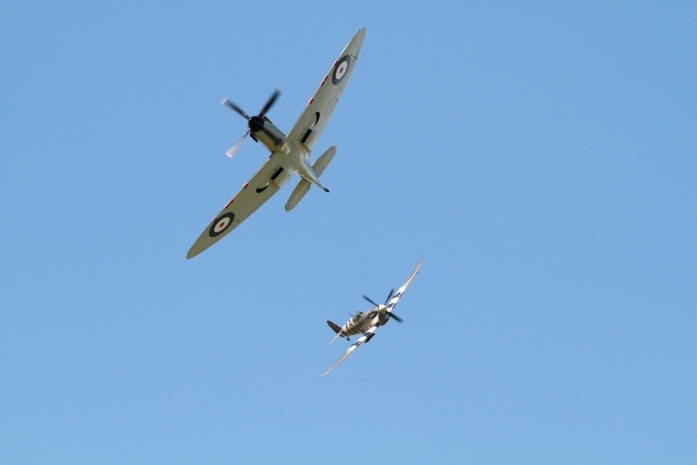 Which filled the sky with such grace over the downs of Shoreham. 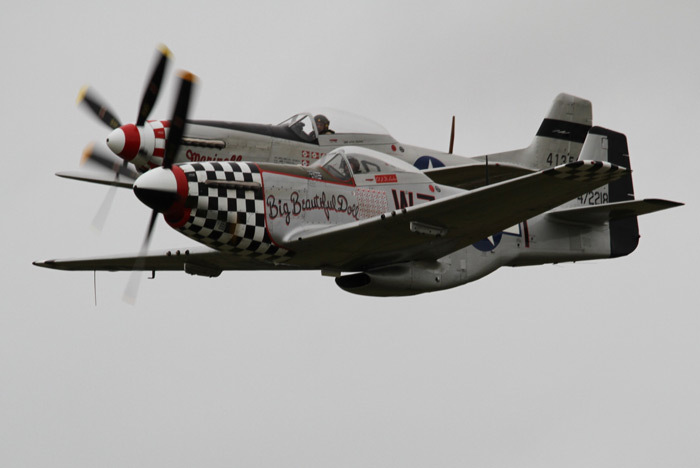 Hopefully a sight to be seen next year. 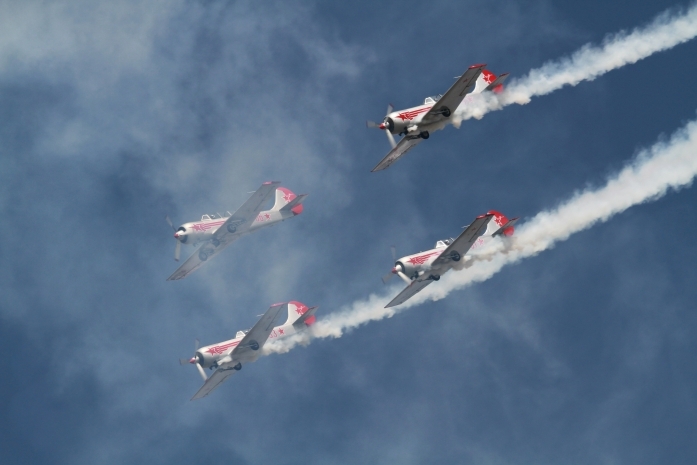 What makes an air show? 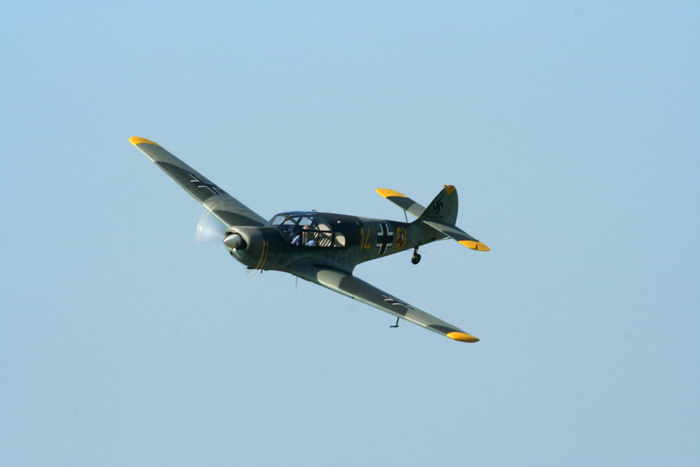 Aircraft, public, good weather and the atmosphere. 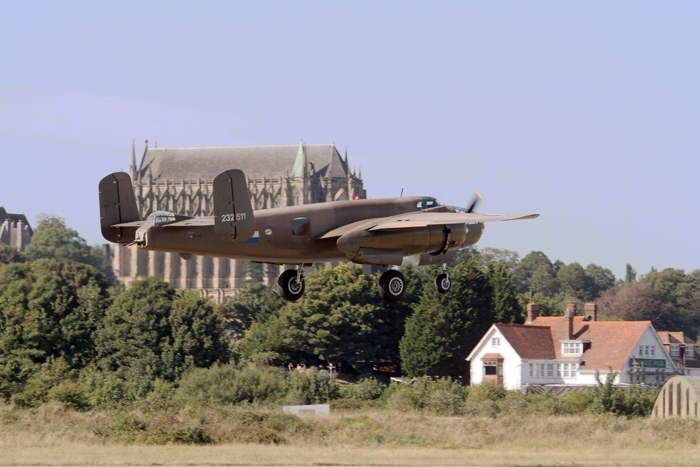 Well done Shoreham! 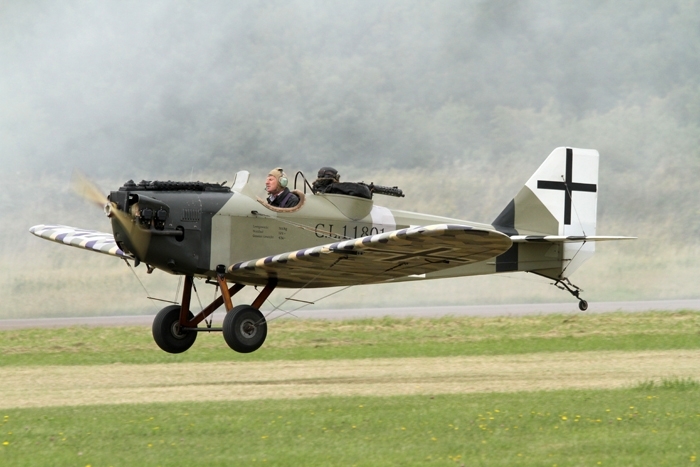 Make a date for 2010. 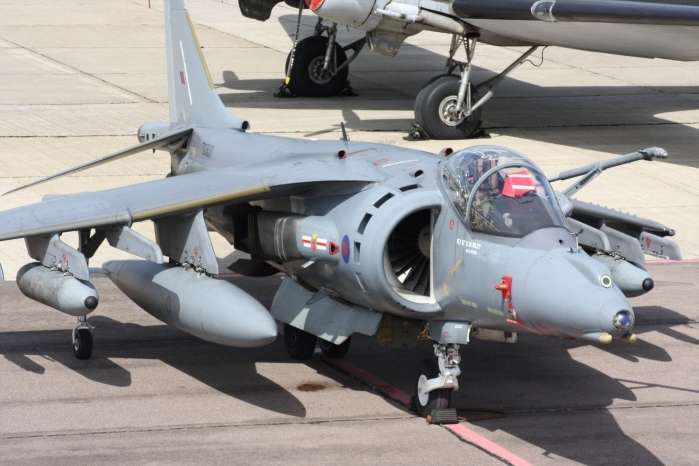 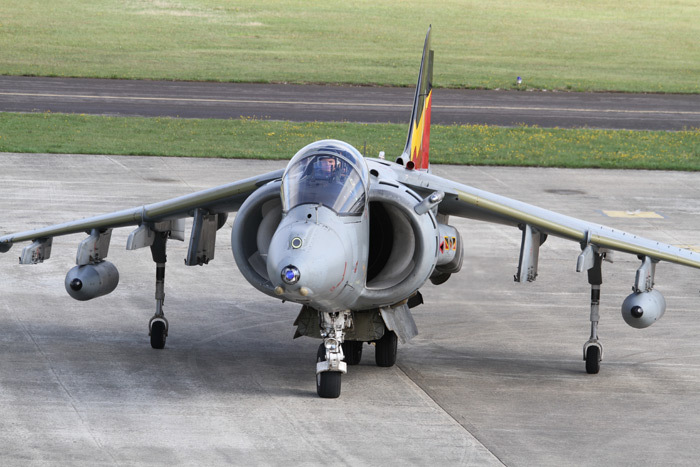 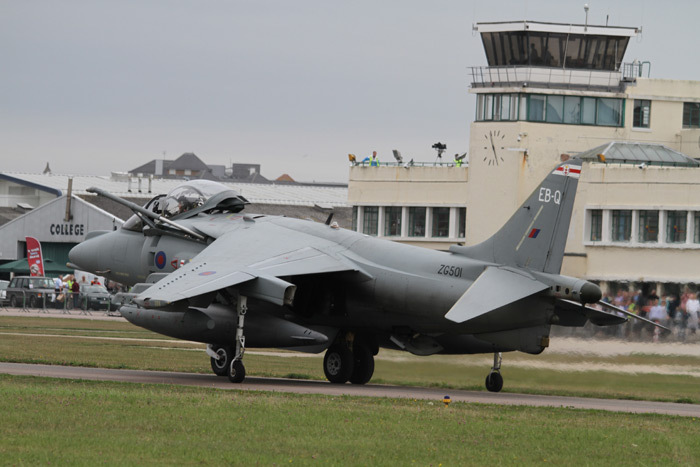 An added static bonus, a Harrier of 41 R Squadron from RAF Coningsby. 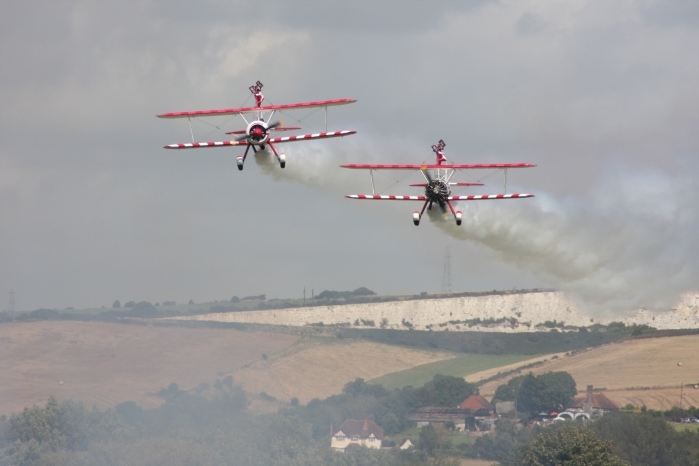 Shoreham's 19th annual air show got off to a good start with the Saturday weather allowing a full flying display to go ahead, but Sunday was a totally different day. 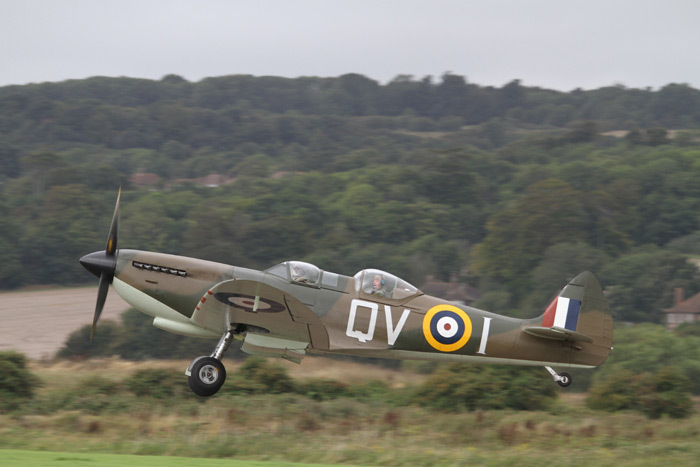 With cloudy skies and poor visibility for much of the day, it caused a few problems for the display, but even bad weather couldn't stop this being one of Shoreham's most successful air shows yet. 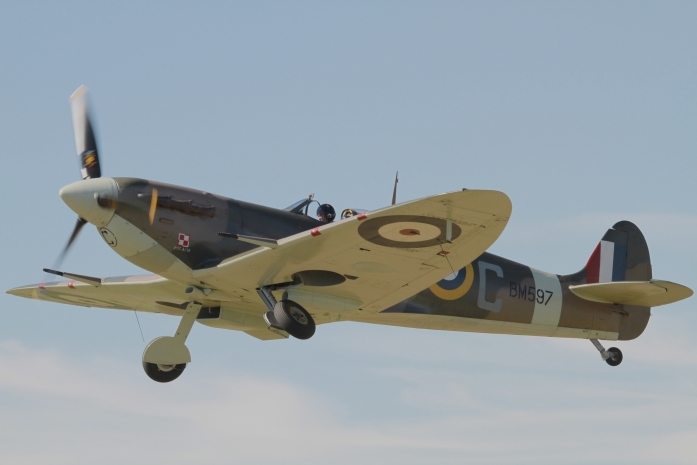 With aircraft coming from far and wide including The Battle of Britain Flight's Spitfire, Hurricane and Lancaster. 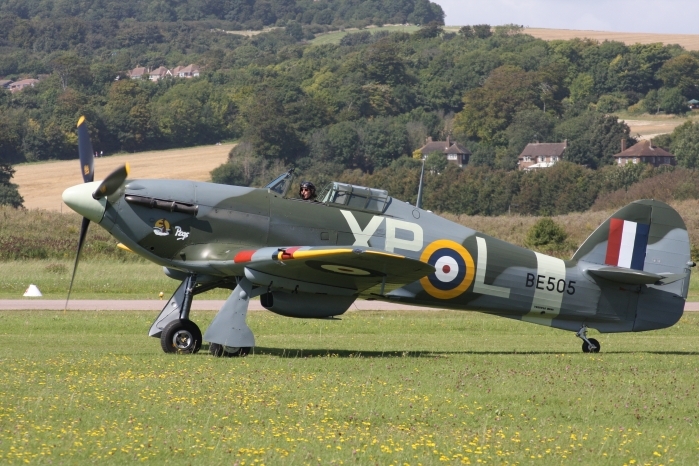 With a liberal sprinkling of warbirds, including a Hurricane, Spitfire, Mustang and Kitty Hawk and aircraft from the RAF, a Tutor, Typhoon and Hawk.